On 21 October 2015, we had the honour of welcoming Imam Khalil Jaffar from Islamic Cultural Centre Copenhagen and the General Director of Muslim World League offices in Copenhagen, Mr Abdul Allah Maarouf Al-Rasheed, to our offices. As per standard procedure, our factory, offices and Muslim supervisors were audited to make sure we follow the guidelines advised to us by Islamic Cultural Centre and Muslim World Leagues Mecca. We wish to thank both gentlemen for their approval of our premises and people, and the recommendation they put forward to us during our meeting. 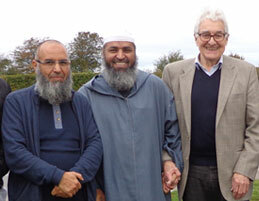 We had the honour of welcoming Imam Khalil Jaffar and Mr Abdul Allah Maarouf Al-Rasheed.